Environment Minister Thérèse Coffey has announced today that the UK has joined global efforts to safeguard the world’s coral reefs from climate change and rising sea temperatures by officially signing the Coral Reef Life Declaration. The announcement was made at an event at the National Oceanography Centre in Southampton, where High Commissioners and members of the UK’s science community got together to celebrate marine science ahead of the Commonwealth Heads of Government Meeting which will take place in just one week. 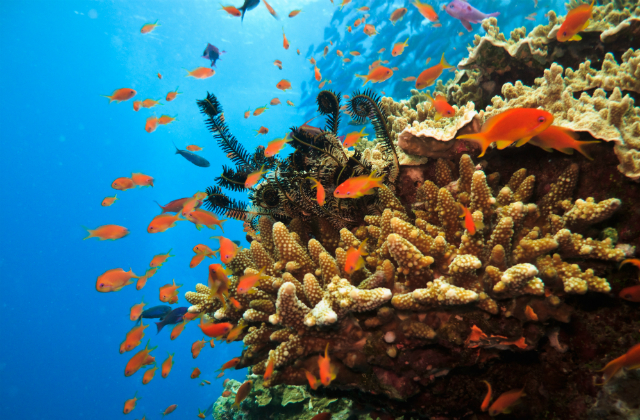 The countries of the Commonwealth account for nearly half of the world’s coral reefs, including Australia’s iconic Great Barrier Reef, and England’s very own 8,000 year old cold-water reefs in The Canyons Marine Conservation Zone. Few people know the waters around the UK contain riches to rival the tropics – with our waters home to a vast array of cold water coral reefs that protect important marine life. Through tapping into the UK’s world-leading marine science and working with our partners across the Commonwealth, we will help to safeguard this vital habitat and protect our oceans for future generations. So far, 12 countries have signed the Coral Reef Life Declaration, which was launched by Prince Albert II of Monaco at the Our Ocean conference in Malta last year to encourage countries to come together to protect coral reefs. Over the weekend the Environment Minister Thérèse Coffey responded to reports that some Thames Water customers have not received appropriate compensation for the loss of their water supply following the big freeze last month. The Sunday Telegraph reported that many customers have only received minimal compensation after going 48 hours without water last month, despite Thames Water’s promises to go beyond the statutory minimum. Minister Coffey and Environment Secretary, Michael Gove will address the issue directly with Thames water later this week. The tens of thousands of people across Southern England who lost their water supply following the big freeze last month must be properly compensated. We are pleased Thames Water has agreed to go beyond the statutory minimum and pay those customers’ worst affected up to £150. Michael Gove and I are due to meet Thames Water next week and will raise the issue directly to make sure they honour that commitment.